He brought this learning to Canada; always fresh, natural and local. As his career began to take shape, Massimo made sure that wherever he worked only farm fresh ingredients were used to create his gourmet pizzas, amazing risottos, pasta dishes and his many other succulent dishes. 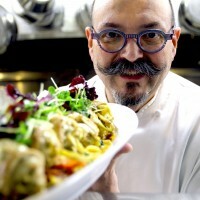 Massimo Capra is known across Canada because of his many appearances on The Food Network, CityTV, his own cooking series named “Gourmet Escapes” and let’s not forget his trademark moustache. 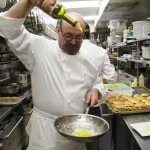 He operates two restaurants in Toronto, Mistura Restaurant and Sopra Lounge; two at Pearson Airport-Terminal 1 domestic departures called Boccone Trattoria Veloce and Boccone Pronto at the U.S. Transborder departures also in terminal1; and The Rainbow Room at the Crown Plaza Hotel in Niagara Falls. Massimo meets with all of his food growers to select the finest ingredients. He usually can be spotted in various produce isles at supermarkets and farmers markets holding, smelling, looking for purity and life in all of his ingredients. Life? Yes, life! 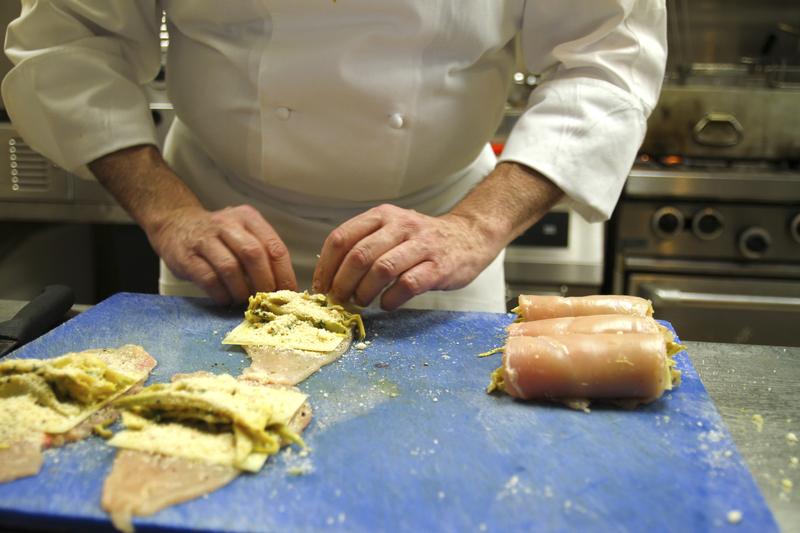 “The more life in an ingredient, the better the taste,” explains Chef Capra. 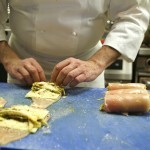 Massimo Continually talks with his customers and from their comments he creates his recipes. 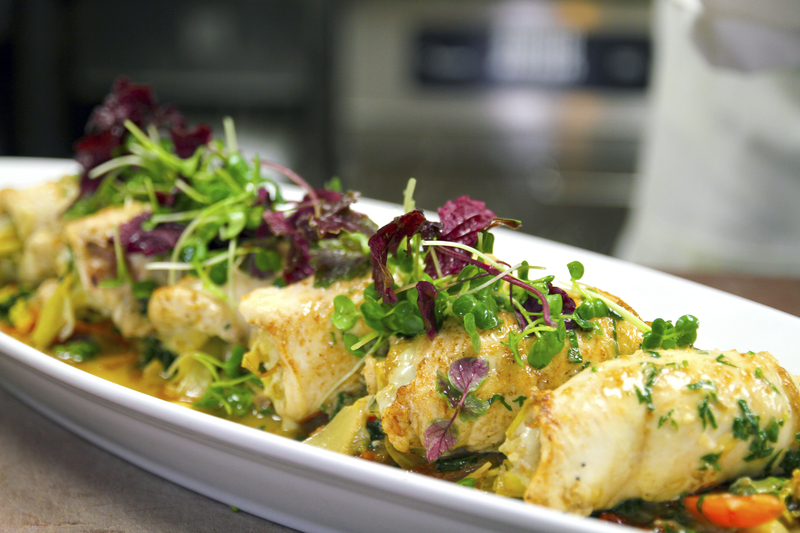 He also travels the world and meets many amazing chefs and together they discuss and cook local favourites. This usually sparks an idea in Massimo, for a new recipe or a spin on an old favourite. He welcomes his vendors to his restaurants and personally speaks to them, sampling everything before it is added to his menu. Massimo enjoys talking about his squash ravioli. When he came to Canada in 1982, there was nothing like this in the restaurant scene. 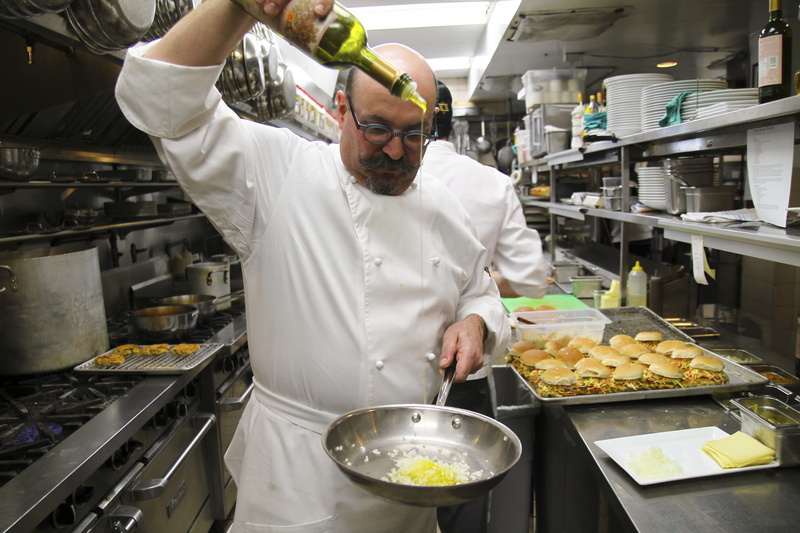 His area of Italy is known for growing squash (locally called zucca). So much of it was grown that it was used in everything including as filling for ravioli. It became very popular among Italians and now with Canadians. • Get the chicken breast ready by pounding it down. 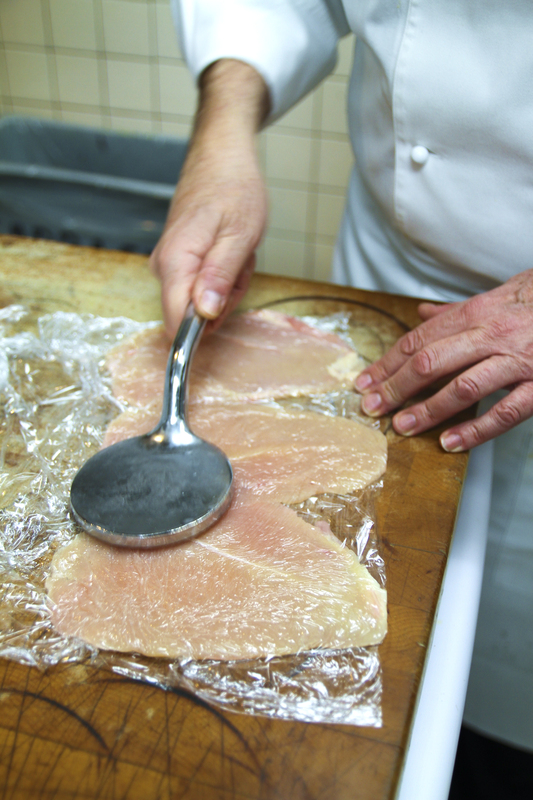 Put the breast in between two sheets of parchment paper or plastic wrap and flatten it. 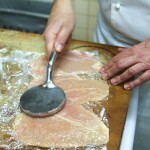 Doing this keeps your cutting board clean of any contaminants. • Use regular bread crumps (not powdered) because they are more flavourful to the palate. • Wrap the chicken breast in all directions with no hanging corners to minimize or eliminate leakage of the cheese filling. You will want all the moisture to stay inside of the meat. • If you prefer, give the chicken breast roll a very light dusting of flour. It will extract more of the saltiness from the chicken breast. 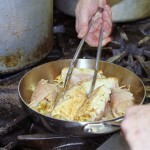 • Sauté the chicken breasts by rolling it in the frying pan. Once they are seared, add the wine and all else. 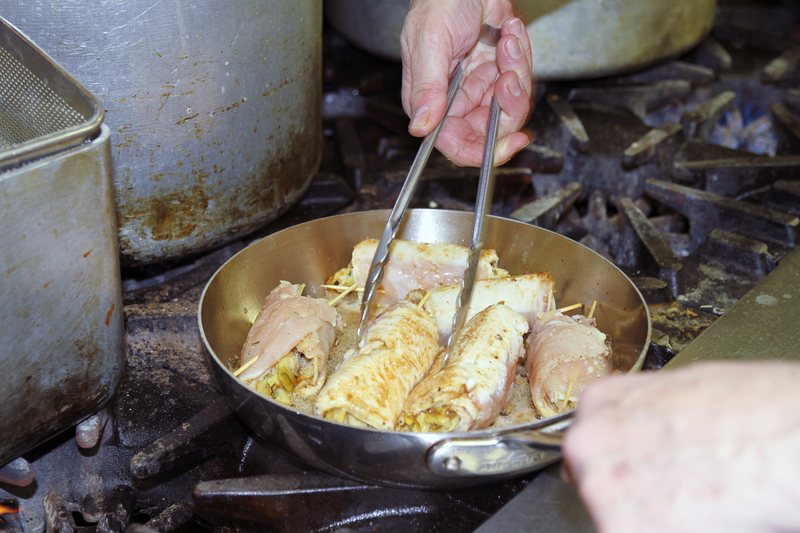 • You can replace the tooth picks holding the rolled chicken breast by wrapping them with bacon. Preheat a skillet and in it add some of the butter and some of the oil, add the minced onions and garlic and cook until translucent, add the oregano and stir, add the artichokes and cook for three to four minutes stirring constantly, once the artichokes are dry set aside to cool off. Lay the slices of chicken breast on a board and lightly pound it to even out the thickness, season with some salt and pepper, place a slice of cheese on it and then spread some of the artichokes, sprinkle some bread crumb and then roll the chicken like a carpet and use a skewer to hold three rolls per person. Preheat a sauté pan and in it add the remainder of the butter and oil, once it starts foaming add the chicken skewers. Cook gently for four minutes then turn and cook a further four minutes, sprinkle with the wine and reduce by half or more then add the chicken stock and simmer for another three to five minutes, place a lid on it and turn the fire off while you prepare the vegetables. Preheat a sauté pan and in it add the oil and butter; add the pancetta, garlic and the sundried tomatoes, cook for a minute and add the fennel and the carrots, sauté for a minute more, then add the rest of the vegetables and stir well. Cook for four to five minutes, season with salt and pepper to your liking and serve.